Theoretical considerations show that the electoral system cannot be expected to produce government that represents the values and interests of the general public. The two mechanisms advanced for the idea that the electoral system is representatives – the virtue based mechanism and the rewards based mechanism – both do not withstand scrutiny. The widespread support for the 2011 anti-government protest movement in the West indicates that in many countries the public sentiment is that government is indeed not representative. Abstract By allowing voters to choose among candidates with competing policy orientations and by providing incentives for incumbents to shape policy in the direction the public desires, elections are thought to provide the foundation that links government policy to the preferences of the governed. 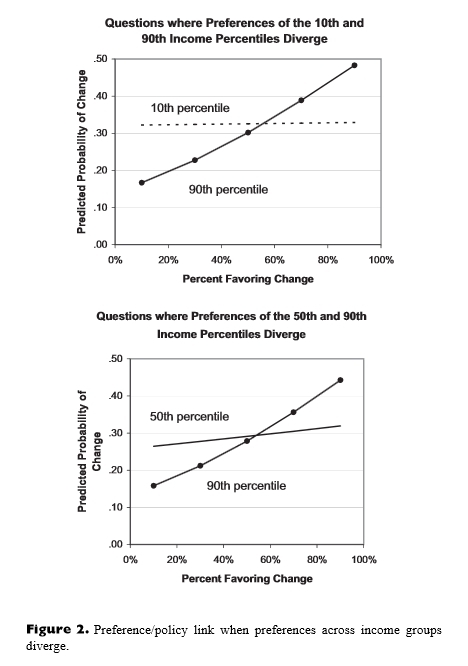 In this article I examine the extent to which the preference/policy link is biased toward the preferences of high-income Americans. Using an original data set of almost two thousand survey questions on proposed policy changes between 1981 and 2002, I find a moderately strong relationship between what the public wants and what the government does, albeit with a strong bias toward the status quo. But I also find that when Americans with different in come levels differ in their policy preferences, actual policy outcomes strongly reflect the preferences of the most affluent but bear virtually no relationship to the preferences of poor or middle-income Americans. The vast discrepancy I find in government responsiveness to citizens with different incomes stands in stark contrast to the ideal of political equality that Americans hold dear. Although perfect political equality is an unrealistic goal, representational biases of this magnitude call into question the very democratic character of our society.